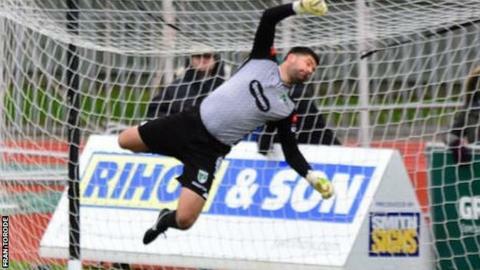 Guernsey FC goalkeeper Chris Tardif says he has no intention to end his career any time soon. The 36-year-old, who played for AFC Bournemouth, Portsmouth and Oxford United, considered retiring three years ago, but has been Guernsey FC's first choice since their formation in 2011. "I'm really enjoying my time still," Tardif told BBC Radio Guernsey. "I have no intentions at the moment to see the end of it and I'm enjoying what I can get from it." Guernsey-born Tardif says the chance to give something back to his home island and the chance for his family to see him play is what is spurring him on. "It always great to have my family around to watch me play," he said. "That's a really nice thing for me to have at the end of my career because my children were never quite at the age to see me play professionally or semi-professionally, so it's nice to show them what hard work can get you." Tardif has seen Guernsey FC win two promotions in their first two seasons, and the club currently sit third in Isthmian league Division One South after a run of eight games without defeat. "It's a great little run at the moment, but that's all it is to be honest at this point in time, a great little run," added Tardif. "We're now stepping into the business end of the season, so let's make sure that run turns into something positive and we get into a play-off position and cement that play-off position. ".